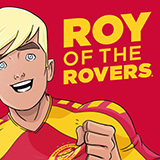 The Roy of the Rovers app is here! Huge news, Rovers fans: the Roy of the Rovers app is here! That's right, Roy has finally gone digital, and you can download the new app right now. The Roy of the Rovers app features free comics, games, and lets you read the brand new Roy of the Rovers stories in digital form! Head to your app store of choice and download the app now! The Official 2018/19 Home Kit is here! 10,000 book Roy of the Rovers charity giveaway!